In the sport region Achensee you have plenty of possibilities to spend an active holiday. 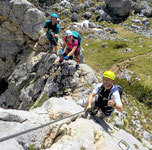 Besides common holiday activities we want to present you a special outdoor sport program. Enjoy our webside and choose your preferred activity!